When We Have Failed - What Next? �All have sinned,� says the Bible, leaving no one exempt. Yet we cringe at the very thought of our own failure�especially a �big� one. We try to cover it up and hide it from the world�particularly from those closest to us. But we cannot hide it from ourselves and inevitably, along with the actual failure comes the awful sting of regret, disappointment and feelings of worthlessness. We wonder how there can be a �next,� because we feel that our life is over or that we are destined to remain in our same rut of failure forever. But author K.P. Yohannan boldly declares that nothing could be further from the truth! 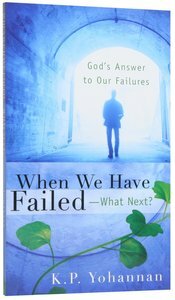 In When We Have Failed�What Next?, the president of Gospel for Asia graciously takes us on a journey from our darkest failure toward a bright and hopeful future. He again and again depicts God�s unfailing love for us and His marvelous ability to bring out His very best for our lives, especially in the midst of our failure. This is a book that makes no compromise with sin, but that encourages all of us to believe in God�s grace�and in His purpose for our lives�and to look up, for the best is truly yet to come. About "When We Have Failed - What Next?" Yohannan is founder and international director of Gospel for Asia. He was born and raised in India.